What has Sport England ever done for you? Two young climbers enjoying the scenery and exposure on a Youth Meet in North Wales. We realised that a number of our members raised questions about what we really need Sport England funding for. Here are 11 BMC work programmes, job roles, courses, and more, that are currently run with the support of funding from Sport England. From clubs to competitions; hill walking to youth, you might be surprised at the diverse support for the BMC. Sport England provides major support for the BMC’s hill walking work. They fund the post of our hill-walking officer, who drives the implementation of the BMC hill walking strategy, and funds visible projects such as skills courses for walkers, skills and inspiration advice and articles and skills films. In fact, without our hill walking officer, Mend Our Mountains probably wouldn’t exist. Sport England funds our talent development program. This is a major program for young climbers aged 12-19. We provide coaching, development events and support for entering international competitions. This helps them progress their climbing into the senior teams, representing Great Britain and maybe the Olympics. Sport England funds our clubs officer. Our clubs officer supports all BMC clubs and looks at how we can help new and existing clubs grow. We provide advice and liability insurance for clubs, specialist guidelines, advice on legislation, child protection and GDPR. And previously Sport England has also provided grants for club websites, training and equipment. Sport England funds an equity officer post. This developmental job for climbers and walkers has led to a range of on-the-ground initiatives to reduce barriers to anyone who has the desire to start climbing or walking. There’s been plenty of work behind the scenes – such as our equity symposium and working on getting women into higher profile outdoor roles, including at the BMC. And there’s also been some highly successful work, such as the BMC TV Women in Adventure Film Awards, training courses for women, support for the Women’s Climbing Symposium and funding for women-specific indoor-outdoor courses. It funds the BMC Youth Officer, who develops and co-ordinates all our youth events. These include our youth meets. These give young people their first chance to try outdoor climbing in a club environment, and are often run with clubs like the FRCC. The support allows us to run skills courses together with AMI instructors. These discounted courses in sport, trad and bouldering have been running for eight years and have benefited over a thousand people who’ve wanted to make the leap from indoor to outdoor climbing. Funding from Sport England helped us run our Student Safety weekend. Every year, up to 100 students spend the weekend at Plas y Brenin, learning how best to run their student walking or climbing club. Sport England funding supports all our national competitions. That’s the BBCs, JBBCs, BLCCs, Youth Open, Welsh Open and YCS. Without Sport England funding, we wouldn’t be able to run all these events. BMC TV was originally started thanks to Sport England support. Thanks to Sport England, we have now built up a resource of over 800 skills and inspirational films for climbers, walkers and mountaineers. In fact, films such as Operation Moffatt would not have been made without Sport England. As the BMC is the national body for climbing, hill walking and mountaineering, as recognised by government, we also bid for money for the NICAS and NIBAS schemes to run. These schemes help countless young climbers progress and stay motivated. As the BMC is the national body for climbing, hill walking and mountaineering, as recognised by government, we also bid for money for Mountain Training to help run all its awards and coaching pathways. If you would like to see this work continue, then please vote for Option A in the BMC AGM. We need 75% of the votes to be in favour of one option in order to adopt a new constitution. If you're a BMC member, please check for an email from ERS for your personal URL to vote. It's quick, simple and only takes a minute. Your AGM: Thanks for your vote! This year's historic AGM had a record voting turnout, with 6,796 of those votes being made online. We want to thank everyone for having their say and helping to shape the future of the BMC. We were asking our members to vote on some significant changes to the BMC's constitution. Part of the discussion was the relationship between the BMC and Sport England. READ: What are Sport England Tier 3 and Tier 1 relationships? There were two constitutions to vote for: Proposal A (as recommended by National Council) and Proposal B, proposed by a group of members. To learn more about the two proposals, you can read a detailed comparison written by BMC honorary solictor Martin Wragg. How did the recommendations get decided? Read more about the process that lead to this stage, including the reports from the Organisational Review and more. Climbing, hill walking and mountaineering are changing. We need your help to shape the future of your BMC. We need your help to build a better BMC. We're asking all our members to vote in a new constitution from two options. 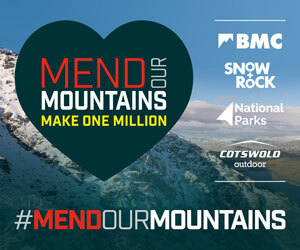 And now, six BMC ex-Presidents, two Patrons and Britain's best sport climber have come together to collectively support Option A. Climber Hazel Findlay explains why she’s helping to build a better BMC by voting for our new constitution. Thanks Pete - I've already voted option A but this was very interesting and helps put the impacts of the decision into perspective.